"DFW's 5 Star Termite Treatment Combines The Best of Baits and Liquids For The Best Protection Available"
DFW Pest Control gives you the best of all the available treatments CUSTOMIZED to your homes exact needs. Most pest companies offer either a "Termite Bait" or a "Liquid Barrier" treatment. Which is best ? Which is the most effective ? Which treatment will give you the best value for your money ? At DFW Pest Control, we make it simple, effective and most of all - affordable. We give you the best of both. DFW Pest Control gives you the best of all the available treatments CUSTOMIZED to your homes exact needs. DFW Pest Control kills termites and protects your home in 2 ways. First, using Termidor, we kill termites on contact and stop further damage from occuring. This protects your home from termite damages over and above what has already occurred. Second, (optionally) we install Sentricon® Termite Bait Stations containing Recruit HD® with Always Active Technology® around the outside of your home to kill the termite colony. Termite Baiting with Sentricon has proven to be the most effective and reliable form of termite colony elimination while also helping to protect the environment. Outdoors - where termites are active and mud shelter tubes are located, a shallow trench is hand excavated to a depth of 4-6". This is performed on 5 linear feet each side of mud shelter tubes. Termidor is applied into this trench at a rate of 4 gallons per 10 linear feet. Next, where termites are active, attached porches and garages that are a separate pour from the main foundation and have an expanion joint attached to the main foundation are drilled and the expansion joint treated. This is done by drilling a small 1/2 inch hole completely through the cement to allow Termidor to be injected underneath and into the soil. After treatment all cement holes are patched and swept clean. Indoors - where termites are active, or live activity is suspected, visible damage found, etc, - plumbing penetrations, and slab openings (slab foundations), are treated by injecting Termidor foam into the wall voids to kill existing termites and prevent further damage. In some situations, drill holes may be needed to allow injection of Termidor liquid below the slab foundation. All drill holes whether into the walls or cement are patched covered and sealed to your complete satisfaction. How Is The 5 Star Treatment Plan Different From Bait Only Systems using Sentricon® Only? Termite bait only systems - (those using no other chemicals) require that the termites find and feed on the termite bait stations. This takes time. There are no Universities that recommend using a termite bait system without first using chemicals to kill existing termites and prevent further damage. Sentricon takes some time to work, and during this process, if termites are not stopped chemically, further damages will occur. In some cases, Recruit AG®, or an ABOVE GROUND termite bait station can be placed directly on walls or trim. Since this process also involves time, in most cases however, a chemical treatment is preferred which kills and controls termites in isolated locations much faster than baits alone. 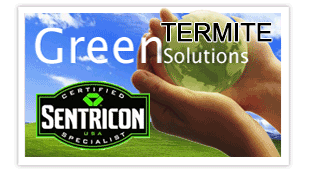 DFW Pest Control's 5 Star Termite Treatment Plan uses Sentricon® and Termidor® - the very best of all currently available termite control products for a quick kill and long term prevention of termite attack. While some companies save money by use older and less costly termite bait systems such as Advance, or generic termite chemicals such as Taurus SC, DFW Pest Control uses only the very best products and does not compromise expense or quality when protecting your home or business. Is The 5 Star Termite Treatment Plan Guaranteed ? YES ! DFW Pest Control has one of the best guarantees and the fastest response times in the North Texas Area. Should termites re-infest your home after treatment, our technicians will promptly return to your home - no questions asked. Our guarantee has us returning annually - every year to inspect your home and the Sentricon® Termite Bait System. Every home is protected by DFW Pest Control's $2,000,000 general liability insurance plan - more than 4 times what the Texas Structural Pest Control Board requires and one of the best insurance coverage's in the business. You can count on DFW Pest Control and our commitment to excellence.